Let’s imagine you are buying a house in Mallorca and are shipping your precious furniture to the island. Unfortunately, however, the house is not yet completely finished and you are faced with a problem: where can you store your belongings until you are ready to move in? Finding a solution is now easy: you can simply store your stuff big or small in one of the self-storage warehouses on the island. You can rent a dedicated storage unit, where only you can gain access 24 hours a day, if you take the offer from Extraspace. If you decide on the spur of the moment to pick up some urgently needs items you can go there without the need to make an appointment or call to announce you’re on your way. The huge worldwide business of flexible personal storage units has finally reached Mallorca. The idea was born in the USA shortly after the Second World War and today there are an estimated 50,000 storage warehouses to choose from. The market is already saturated in Australia and huge growth rates are predicted for Europe as the demand for customised and flexible storage solutions is ever growing. The reasons for this phenomenal growth are quite obvious: a lot of modern day apartments lack storage space. Where do you put your bicycles, winter clothes and things you don’t use but you also don’t want to give away? A lot of businesses are also facing the same problem. Especially, when a business has just opened or a large order arrived, the owners need space to store their supplies. To hire a warehouse is expensive if you are look enough to find anything available and is not really flexible as requirements can change quickly. Therefore, it is a mixture of private and business people who decide to rent a self-storage unit. The system is easy. The customer decides how much space they wants to rent. This can be as small a 1 square metre. A popular size is 8 square metres which is enough to store the furniture from a 50 square metre apartment or 200 square metres for full container loads. Even cars and boats can be safely stored when required. The Extraspace customers receive a PIN number, which is typed in to gain access to the warehouse. 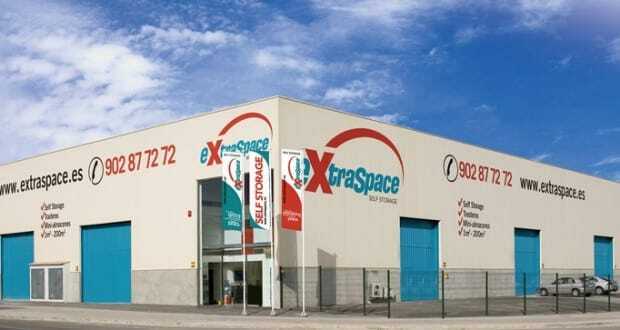 Located in the Polígono Son Valenti, Extraspace is the latest company offering storage services. The most popular units are the smallest ones, ranging from 1 to 5 sqm and then again those from 10 sqm and larger. The building is protected by video surveillance 24 hours a day. Entry and exit are controlled by a PIN. The storage units are distributed on 3 floors. Each unit is individually locked and only the customer has a key. Should a client be tempted to explore his neighbours unit, the alarm goes off instantly. Sophisticated security is a key factor in self-storage as you don’t want self-storage to turn into self-service! The services on offer includes anything from suitable packaging material to reception of the goods in the customer´s absence. The customer decides how long they need the storage unit. Anything fit for storage can be stored in self-storage. Not allowed are easily inflammable goods, drugs or fresh products which are easily perishable. Extraspace offer customers a basic insurance package free of charge which covers any possible damage. In addition each client can insure his items individually. Expectations for the business with flexible storage units are high and Mallorca could do with another warehouse to cater for the one million inhabitants. Throughout Spain there are currently 16 companies with 38 warehouses. Use strong storage boxes (you can usually buy them from the self-storage company) and don`t overpack them. Store heavy goods individually, this makes the boxes easier to lift. Mark the boxes, so that you can easily find what you are looking for. Clean gardening tools and other articles of daily use before storing them. Clothes keep their form when stored hanging-up. Store heavy boxes as a basis on the floor and put lighter boxes on top. Store things you frequently need close to the doors in easy reach. Group boxes of similar sizes together to save storage space. Cover sofas and armchairs and don’t put heavy boxes on top of them. Leave doors of refrigerators and similar appliances open to allow air circulation. We hope you have found this article about the Flexible Storage Space useful and that you have many memorable stays in Mallorca as a result of our recommendations.